The global renal medical devices and services market is expected to register a CAGR of about 6% during 2018-2023 (the forecast period). North America, followed by Europe, accounted for the largest share of the market for renal medical devices and services. Across the globe, chronic kidney disease (CKD) is a major concern, which incurs high economic costs to health systems. It is also an independent risk factor for cardiovascular disease (CVD). All stages of CKD are associated with the increased risks of cardiovascular morbidity, premature mortality, and/or decreased quality of life. CKD is usually asymptomatic until its later stages, where there is a lack in accurate prevalence data. According to independent research estimates, CKD has a high global prevalence ranging between 11-13% with the majority comprising of stage three incidences. Consequently, there is a huge demand for renal medical devices and services, which, in turn, is driving its market growth. Additionally, factors, like increasing prevalence of diabetes and growing aging population worldwide, is responsible for driving the market growth. The current HCFA approach, to stipulate the services which are to be included within the composite rate, is largely empirical and involves several steps. First, the Medicare Provider Reimbursement Manual (HCFA, 1989) lists that the general services that are to be included in the composite rate, in terms of those historically determined by providers, as necessary. HCFA modifies the list over time as clinical knowledge and practices change. This list does not specify a quality standard regarding the services to be delivered but relies on providers to set an implicit standard, with the specific mix of services to be determined by each provider. Although Medicare regulations establish some structural standards for care, and state health code requirements set additional standards (mostly structural), none of these efforts attempts to describe what an adequate set of dialysis services includes. Consequently, the aberrations arising from the same hinder the market growth. Similarly, factors, like lack of awareness regarding renal complications and associated interventions in developing nations, are impeding the growth of renal medical devices and services market. As of 2017, North America accounted for the largest market share, of approximately 40%, of the global market. In North America, due to the availability of robust healthcare infrastructure, the demand for renal medical devices and services is increasing. The rising incidences of renal and cardiovascular complications are also contributing to this demand growth. North America has one of the highest obese patient pools, therefore renal complication incidences is increasing in the region. The region is a home to two of the largest vendors of renal medical devices. 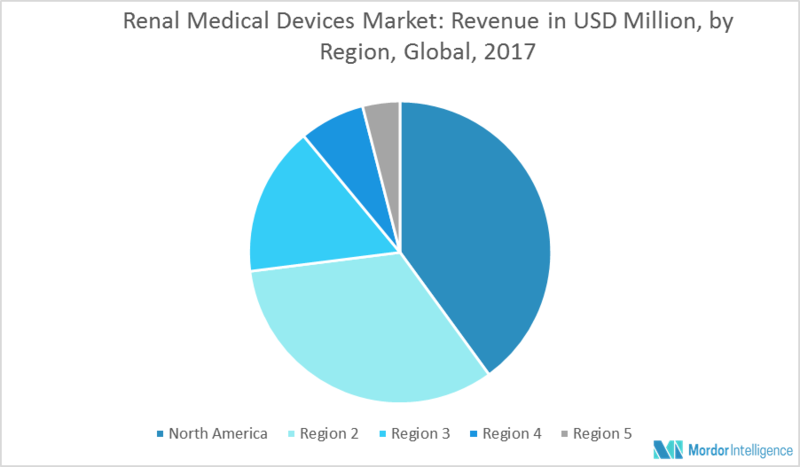 This factor is likely to boost the adoption rate of these devices in local geographies and, consequently help North America to occupy the largest market share in the global renal medical devices and services market. January 2018 - DaVita Inc., a leading provider of kidney care services in the United States, partnered with Epic, the most widely used electronic health record (EHR), which will enhance and grow technological capabilities within DaVita Physician Solutions' chronic kidney disease (CKD) EHR platform. December 2017 - Fresenius Medical Care, the world’s largest provider of dialysis products and services, closed the divestment of Shiel Medical Laboratory to Quest Diagnostics. This divestment follows the expiration of the comment period under the Hart-Scott-Rodino Antitrust Improvements Act. Major Players: B. Braun Melsungen AG, Baxter International, Inc., Boston Scientific Corporation, Covidien, DaVita Healthcare Partners, Inc., Fresenius Medical, Infomed SA, Medtronic, Nipro Corporation, and St. Jude Medical, Inc., among others. 9.5 DaVita Healthcare Partners, Inc.